Bunker base designs have been all the rage in 2018. 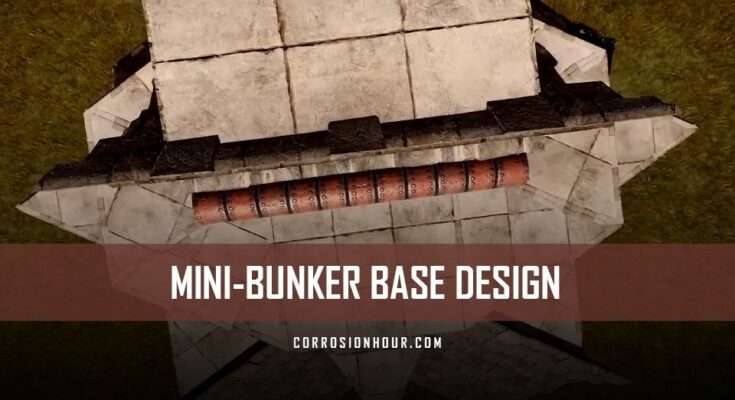 Our partner xRaW has a produced a video on a strong, mini-bunker RUST base design for 2019. Like many of xRaW’s base designs, this base is a starter-to-main base. Starter-to-main bases allow players the ability to incrementally build base designs as the necessary resources become available. This makes larger size base plans available to smaller groups and more importantly, functional at all stages. The mini-bunker utilizes a vault mechanic which is cheap and easy to deploy and remove when needed. This mechanic blocks access at two separate points, so that if the first is compromised there is a back up. 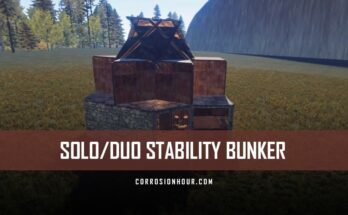 In addition to this, this base design contains advanced base building features such as hard to raid tool cupboard, compact item placements, deceptive roofs, a stability entrance, a considerable amount of storage space and active anti-raiding measures. At these costs, this base is fantastic for both solo and duo player setups. With the use of the bunker mechanic, this is a high value base for its overall cost. Hey guys and welcome back to another video. In today’s video we’re going to be looking at a rust base design called “the mini vault 2”, an improved version of my mini vault for solo or duo players. The garage door here takes you into the base, if you’re worried about how slow garage doors are, swap it out for a sheet double door or add another airlock to the front here. Going through the garage door we have shotgun traps to make the base harder to raid, as well as the first section of the bunker method, 2 interlocking sheet metal roofs, blocking access to the base, increasing the raid cost. To gain access to the base, simply F1 kill and spawn in your bag inside. Once inside you need to open up the windows here, and remove the twig, removing the stability that holds these up. Also remove the twig foundation to remove the third roof here which increases the raid cost further. In here we have your tool cupboard, workbench, 6 large boxes, 4 small boxes, 2 furnaces and your sleeping bag, with plenty of space to get around. To seal the bunker up simply place the twig as i show here and then upgrade the roofs to sheet metal, replace the windows and log off! This base is going to cost you 16.8k stone, 4.2k wood, and 5k metal, you can use HQM for the core but it’ll be more expensive! The upkeep is 1.1k metal, 2.8k stone and 13 wood!